Closet space? 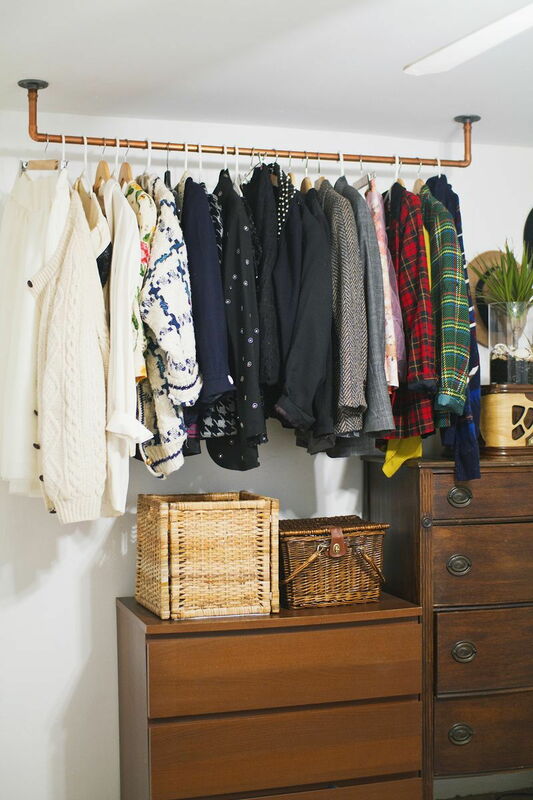 What to do when you don’t even have space for your closet. 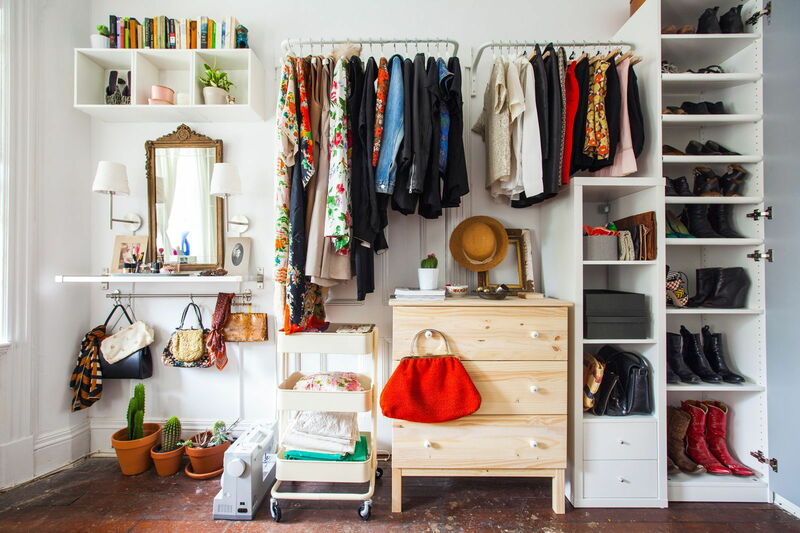 Introducing non-closet storage because we’re here to eliminate bulky furniture, one piece at a time. If you’ve ever had to move house, you know how difficult it is to lug that closet up the stairs, through your tiny door, and onto that prime floor space in front of the window because it just won’t fit anywhere else. Here’s a secret: you don’t need one. Determine how you want to group your clothing. You can do this by type (skirts, blouses, etc. ), colour, occasion, or even all 3 because organising is fun! Create an inventory or rough estimate of all the items you own. We love the Pureple (http://www.pureple.com/) and Stuff N Style (http://stuffnstyle.com/) closet organiser apps which catalogue and keep track of all items in your collection. Both are available for free in the Apple Store. Ask yourself if folding is a deal breaker. If it’s not, what amount would you find manageable? 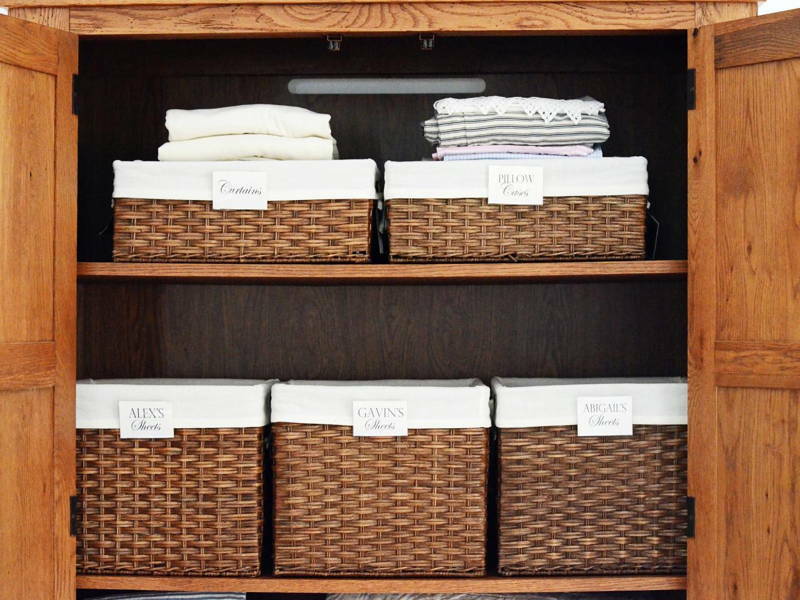 Keep seasonal clothing separately in labelled storage bins or vacuum sealed bags. You should also allocate space for miscellaneous items like scarves, belts, and jewellery. Solution: Bin it! Instead of folding and hanging, simply toss clothes of a similar nature into pretty wicker baskets or storage bins lined on a shelf. Label your containers for easy identification. The best part? Your bins face upwards so nobody can see the mess inside. Great for: everyday essentials like leggings, underwear, t-shirts, gym gear, or sleep wear that require little thought or planning. This also works for children’s clothing, or linen. Bins are ideal if you have wall space but no floor space. Solution: Organise your clothes, filing cabinet style. For optimal folding results, invest in a folding board that will give you crisp edges in minutes. Filing works best with drawers that are the correct size, but this can be easily fixed with drawer organisers or dividers which you can find at Daiso or most hardware stores. 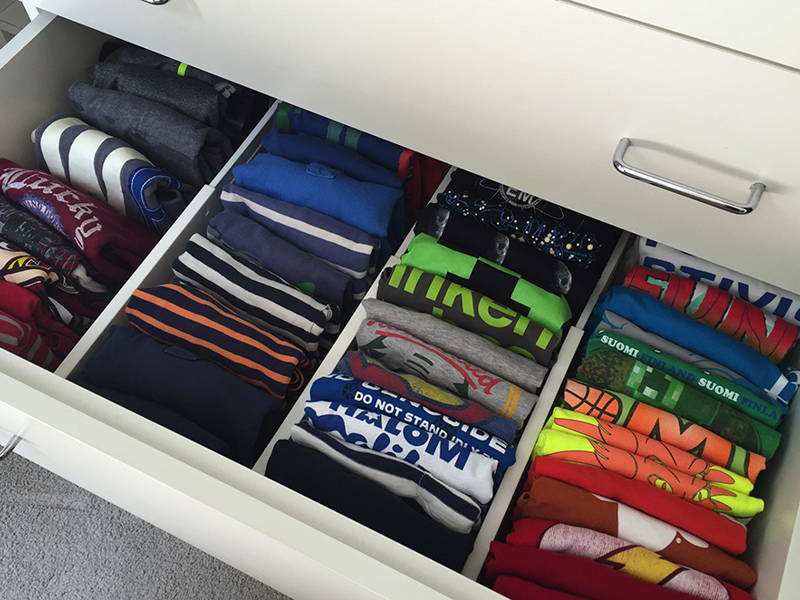 Remember to measure your drawers as well as your clothing. 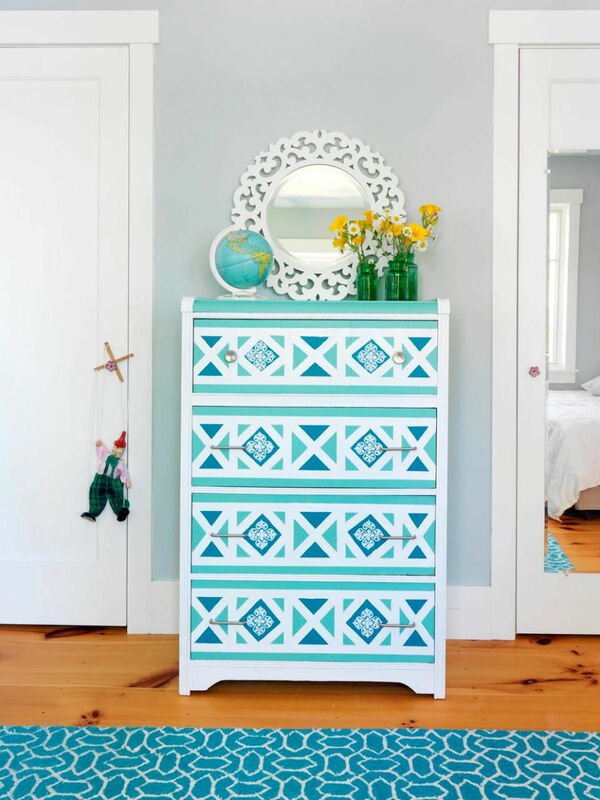 A dresser is also a great way to introduce a splash of colour into your bedroom – all you need is spray paint! Great for: items of clothing that can hold their shape, like bras, t-shirts, thick leggings, or jeans. 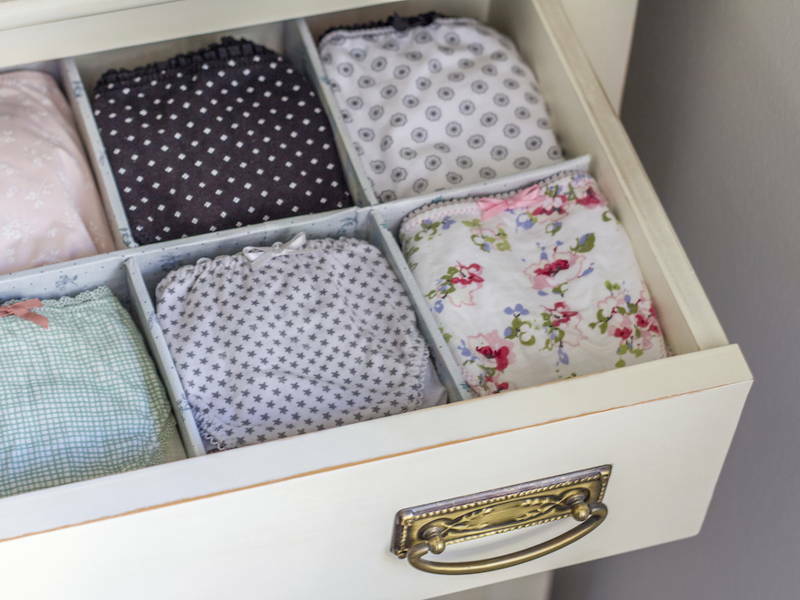 Most underwear organisers have little squares for rolled up undies but you can also stack them if you don’t have pairs for different days of the week. Dressers are ideal if you have limited wall space as they can fit under a mirror or window. 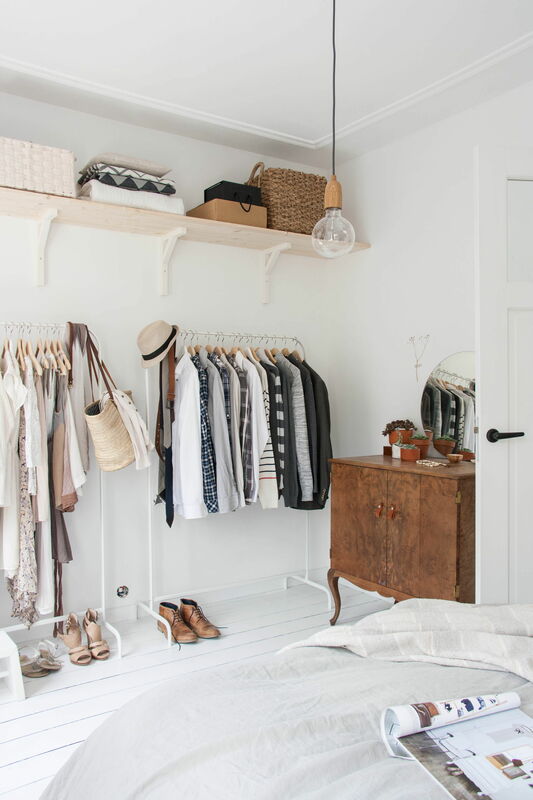 Solution: Rod racks that are built from floor to ceiling are a great way to maximise small spaces, They also mimic a traditional closet – you can stretch your curtain past a clothes rod that’s placed parallel with your window to keep it out of sight. That said, we love the idea of having our clothes out on display – it makes us feel like we’re living in a boutique. Great for: office wear, clothes for special occasions, and easily wrinkled clothing, though as the golden rule goes: if you can wear it, you can hang it. 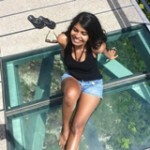 The ceiling’s the limit! 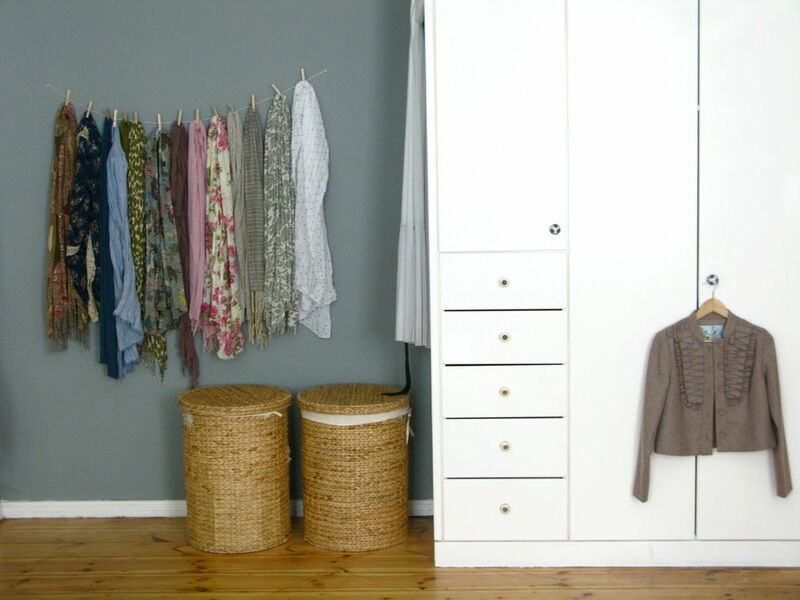 Clothes rods can also be hung over other furniture to take up less space. 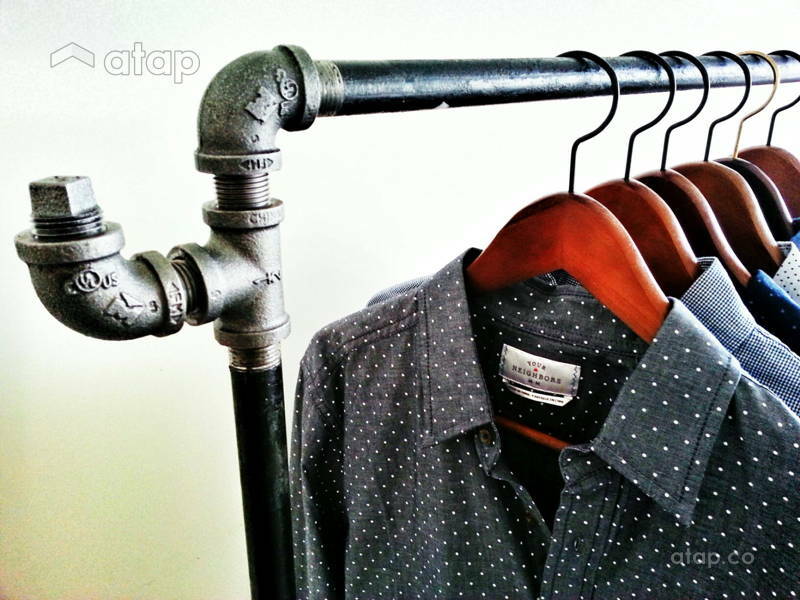 Solution: Substitute your clothes rod for a garment rack if you are not allowed to (or just don’t wanna) drill holes into your walls. 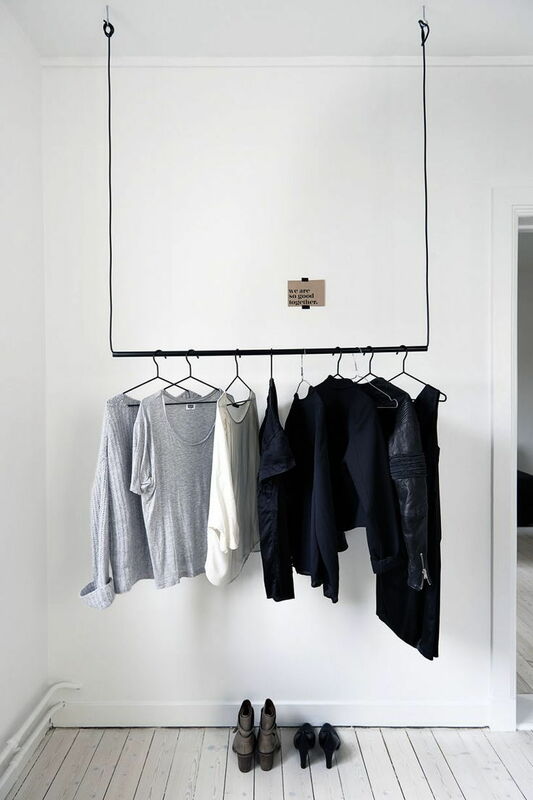 Great for: clothing on hangers that you want to show off. Garment racks are ideal for studio apartments or multipurpose bedrooms where furniture is moved around a lot – push it out of the way for your daily yoga! Solution: Wall-mounted crown moulding or pegs can be used to hang front-facing items of clothing. Great for: fashionable pieces you want to display, or items you use daily like cardigans, scarves, and handbags. These fixtures are ideal if you have a blank wall and want to prove that one can be both creative and utilitarian. 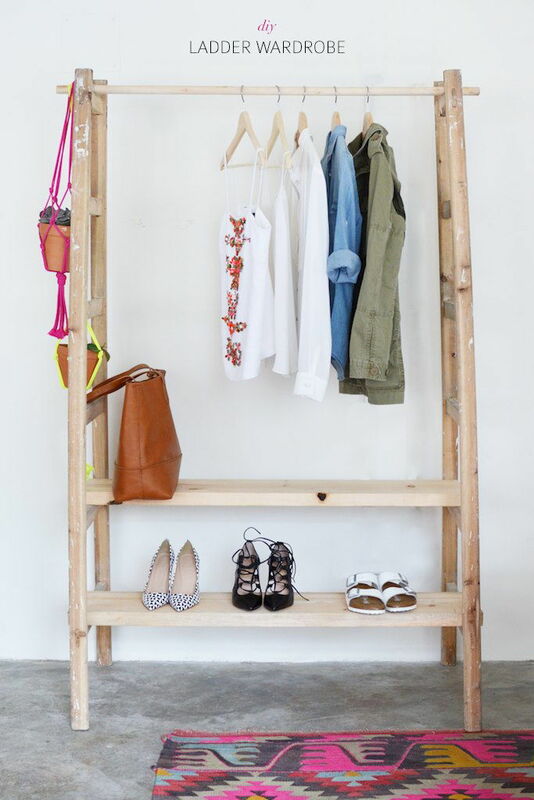 Solution: Turn old furniture into clothes racks! Ladders, chairs, old bins – anything’s possible. Great for: reimagining old pieces of furniture that you might otherwise discard. 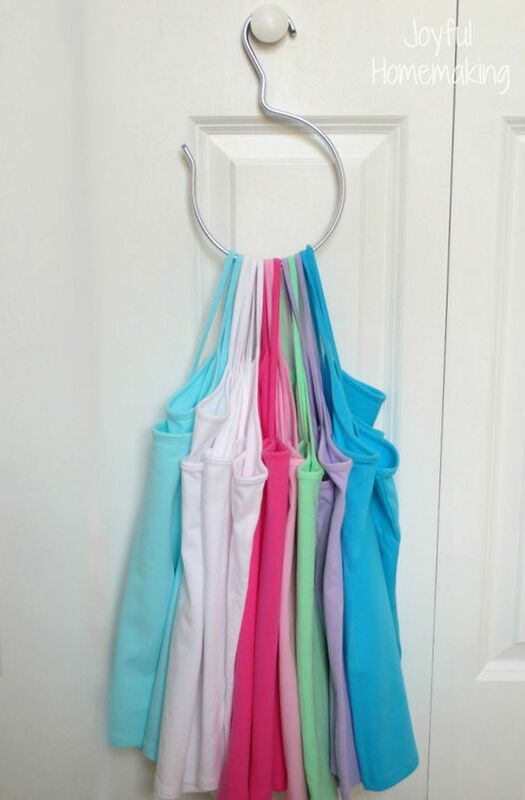 Solution: instead of clothes rods, stretch a tension rod across a blank wall and hang your items with clothes pegs. Great for: hanging lightweight pieces of clothing like tights, scarves, and belts. This is ideal if you need to hang up odds and ends, but don’t want to splurge on rods. Solution: if it’s space you need, put your scarves, ties, string tank tops, camisoles, bras, and other long or strappy items through a large curtain ring or round hanger that you can then hang from a wall-mounted hook. Great for: lightweight, strappy items. Solution: So the only reason you don’t have a closet is because you can’t find one that meets your very exact specifications, dreams, and desires. That and you see no reason to keep your biggest investments behind closed doors. Customise your own open wardrobe! Without limitations like walls and doors, you can position it just about anywhere in your room. Ikea has some great pieces that you can mix and match but we say talk to your constructer and/or designer and build your own! You can also hide your closet space behind drapes or room dividers. If you want to. Great for: everything! This is basically the Greatest Hits album with all the previously mentioned components that you loved the most.